Make sure you note where you choose to download the installer file to so you can find it and launch it later. Now, it will take anywhere from several seconds to several minutes to download, depending on your connection speed, so while that’s downloading, it’s an ideal time to go ahead and move on to step 2. One thing to note here is that, if you already have an account with ThinkOrSwim or TD Ameritrade, then you already have access to paper trading and you don’t actually need to do anything else except download and install the TOS platform (if you don’t already have it). 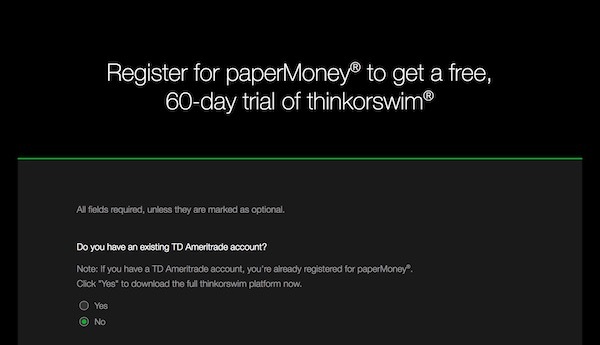 A lot of traders are used to dealing more with TD Ameritrade and are unfamiliar with the thinkDesktop platform itself, so some people aren’t aware you have to actually download the software in order to use PaperMoney. So yeah, do that first. Sign up for a Thinkorswim PaperMoney free trial. This is pretty self explanatory — they walk you through it very well. Just make sure you know where you downloaded the install file, and then double click to open and run it. Make sure you click yes or allow to any permissions requests. Another note here is that, if it makes sense in your situation, I would be sure to install the program for “all users” if it asks you to choose during the installation process. This makes it so that you can more easily use sharing features within the program, such as importing custom indicators, chart studies, scans, and so forth. Install Thinkorswim Paper Money for all users. At the end of the installation, you can choose to have the program automatically launch, and also add an icon to your desktop. If you did one of those, just finish the installation and it will launch the program for you, or you can double-click the new icon on you desktop. Otherwise, fish through your applications / programs folders until you find the thinkorswim application, and launch it. I have a Mac and keep my icon anchored to the dashboard for easy access, and Windows users can equally pin the application to their taskbar or Windows Start menu. When the TOS window opens up, just type in the credentials provided to you by TD Ameritrade / thinkorswim. The login for TDA and thinkorswim are both the same, and the same credentials work for real money as for paperMoney. One thing to note though: there’s a toggle switch to go between real money live trading (green colored) and paper money demo trading (tan/brown/gold colored). Make sure that toggle switch is set right before you start. Then click login! Thinkorswim Paper Money login screen. Be sure to toggle paperMoney on! Demo trading in ThinkOrSwim paperMoney is pretty much the same as live trading in almost every way: you can analyze charts with an impressive collection of indicators and strategies, and use the scan tab to find great setups. You can save custom watchlists and customize the platform in much the same way you can on the live trading side. The biggest difference with paperMoney is that the data feed for TOS in the paperMoney platform is delayed by 20 minutes, whereas the normal platform is real time. Thinkorswim paperMoney simulated demo trading. Hopefully this guide will get you setup and running with your new paperMoney demo account on ThinkOrSwim. In the future I’ll hopefully be doing more guides on how to actually execute orders and so forth. In the meantime, let me know if you have any questions!